Spring is a time of growth and activity—and that’s certainly the case for us here at Breast Cancer Action. We appreciate you coming along with us—communicating via Facebook and Twitter, donating to our Spring fundraising campaigns, and attending one of our in-person events—we thank you! Since breast cancer doesn’t take the summer off, neither do we. There is still so much more that needs to be done. If you’re looking for ways to engage with BCAction and make a difference during the summer months, we’ve got you covered. Attend or host a community eventto celebrate the publication of the acclaimed book So Much to Be Done. 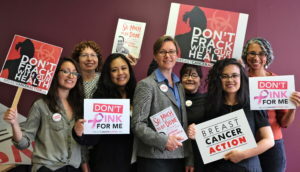 The book is a collection of our former executive director, Barbara Brenner’s, writings about the breast cancer industry and health care activism. It’s a must read for the summer. Help spread the word with an event in your community. March with BCAction staff and members in Philadelphia to demand an end to harmful fracking and dangerous drilling practices that rely on toxic chemicals linked to breast cancer. Be a part of the March For a Clean Energy Revolution demanding a safer world for all. Fundraise with our “Don’t Pink For Me” campaign. We can put women’s health first because we raise funds from individuals like you rather than take money from Big Pharma. You can make a difference by telling your friends and family to “Don’t Pink for Me” and instead ask them to make a donation to Breast Cancer Action in your honor. It just takes a few simple steps to get started. Without engaged and supportive members like you, we can’t demand the system wide changes necessary to address and end the breast cancer epidemic. Without members like you, we can’t put women first. We hope you’ll take action with us this summer.